LAPEER, Michigan – Thanks to the Lapeer community, the recent bottle and can drive at Lapeer’s Webco Press was a success. The area resounded with horns honking in support for the team and mountains of garbage bags filled with returnable cans and bottles. The drive was also a chance for locals to drive student-built robots. The event raised more than $750 in donations from returnables, plus contributions from local organizations and community members. Team members appreciate Lapeer Community Schools and The County Press, L.A. View, and other media outlets for helping to spread the word, as well as the community spirit showed by Kroger and multiple other businesses and organizations where fliers were posted or handed out. Team members say they are grateful for the generosity of the Rotary Club of Lapeer and Lapeer’s Sky Electric, organizations who gave donations during the event, as well as Webco for the use of their parking lot. Since the Chimeras FIRST Robotics Team 1684 doesn’t require members to pay fees ─ despite thousands of dollars in team costs ─ team members rely solely on donations and fundraisers to build robots and travel to competitions. The FIRST Robotics Competition combines the excitement of a varsity sport with hands-on training in science and technology to help high school students discover how rewarding a career in engineering or technology can be. Every student on a FIRST robotics team has a chance to turn pro, and the experience gained often leads to college scholarships and opportunities. To learn more about the Chimeras Team 1684, go to http://www.first1684.com or find The Chimeras FRC Team 1684 on Facebook. To learn more about FIRST Robotics, go to http://www.usfirst.org/roboticsprograms/frc. 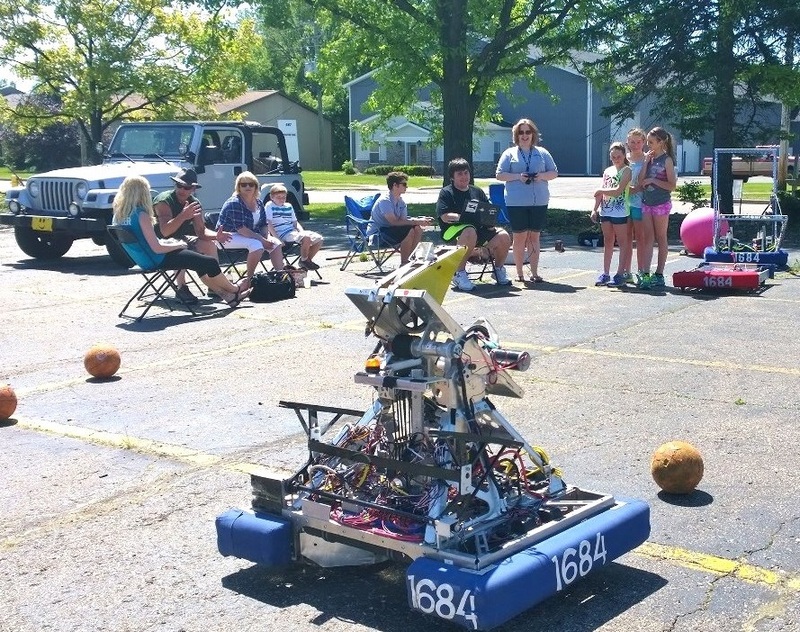 Cutline: Members of Chimeras FIRST Robotics Team 1684 of Lapeer demonstrate driving a student-built robot for local residents during the team’s May 31 can drive at Webco Press. The event netted more than $750 in donations from returnables, plus community contributions for the team, which funds robot-building and competitions solely through fundraisers and donations.